No Civil War military campaign has inspired as much controversy about leadership as has Gettysburg. Because it was a defining event for both the Army of the Potomac and the Army of Northern Virginia, the debates began almost immediately after the battle, and they continue today. 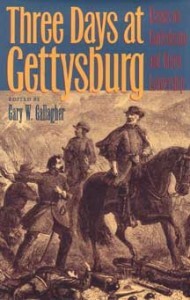 Three Days at Gettysburg contains essays from noted Civil War historians on leadership during the battle. The contributors to this volume believe there is room for scholarship that revisits the sources on which earlier accounts have been based and challenges prevailing interpretations of key officers’ performances. They have trained their investigative lens on some obvious and some relatively neglected figures, with an eye toward illuminating not only what happened at Gettysburg but also the nature of command at different levels. The contributors to this volume believe there is room for scholarship that revisits the sources on which earlier accounts have been based and challenges prevailing interpretations of key officers’ performances. They have trained their investigative lens on some obvious and some relatively neglected figures, with an eye toward illuminating not only what happened at Gettysburg but also the nature of the command at different levels. Gary W. Gallagher is professor of history at the University of Virginia. He is a contributing editor of The Kent State University Press publications Antietam: Essays on the 1862 Maryland Campaign (1989); Struggle for the Shenandoah: Essays on the 1864 Valley Campaign (1991); The First Day at Gettysburg: Essays on Confederate and Union Leadership (1992); and The Second Day at Gettysburg: Essays on Confederate and Union Leadership (1993).